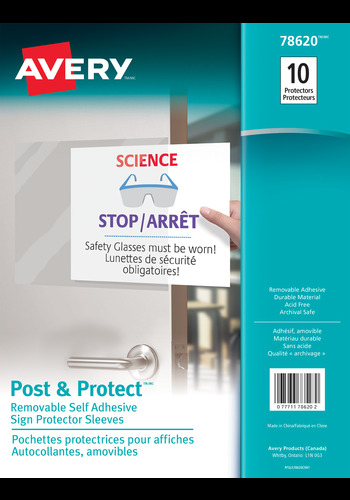 Display important signs or posted information easily and professionally with Avery® Removable Self-Adhesive Display Protectors. With Diamond Clear clarity, these top-load display protectors ensure maximum visibility and signs will look as good as new even after they've been hanging around for a while. Display important signs or posted information easily and professionally with Avery® Removable Self-Adhesive Display Protectors. With Diamond Clear clarity, these top-load display protectors ensure maximum visibility and signs will look as good as new even after they've been hanging around for a while. Each display protector features two strips of removable adhesive that allows you to affix your display signage firmly and remove it easily without damaging the surface. The acid-free and archival-safe material won't lift print from your papers. With these self-adhesive display protectors, all signs point to success. Stick Display Protectors to walls in common areas to announce news, information, directions etc. The Diamond Clear finish offers a polished look and maximum visibility of all your important signage.